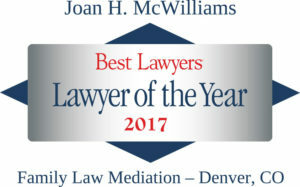 The Denver-based firm of McWilliams Mediation Group is a client-focused mediation firm dedicated to helping families navigate and resolve issues involved in their divorce, including the allocation of parental responsibilities, the division of marital assets and debts, maintenance, child support (and other child-related money issues), tax concerns, and post-decree matters. The goal of the McWilliams Mediation Group is to help parties find creative and effective solutions that enable them to move forward with their lives. Special consideration is always given to the children as they, too, must be able to move forward with their lives. The McWilliams Mediation Group has been helping clients design innovative solutions to complex divorce challenges since 1993. Our knowledge and experience enable us to find constructive ways to resolve complicated problems. Our professionalism eases the journey. 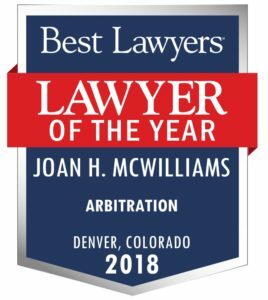 In addition to being recognized as an outstanding professional in Super Lawyers, and as an AV Preeminent Rated Attorney by Martindale Hubble, Joan was recently honored to be named 2017 Best Lawyers Lawyer of the Year-Family Law Mediation and the 2018 Arbitration Lawyer of the Year. 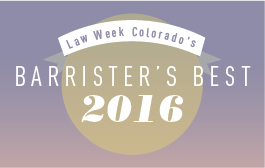 She was also named as the 2016 Barrister’s Best Mediator and the 2017 People’s Choice Best Mediator by Law Week Colorado. 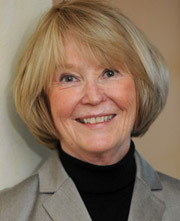 Joan is the recipient of the Outstanding Alumni Professional Award from the University of Denver College of Law and the Family Law Icon Award from the CBA Family Law Section. She initiated the amendment to the Colorado Rules of Professional Conduct, Rule 2.1, Comment 2 regarding parental conflict and children. She received the 2016 Richard N. Doyle CLE Award of Excellence and the 2017 MDIC President’s Award. 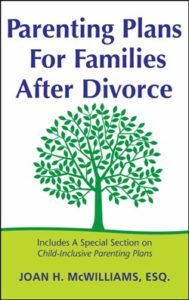 Parenting Plans For Families After Divorce presents a fresh, contemporary and practical guide that shows divorcing parents how to create a healthy and vibrant Post-Divorce Family™. It acknowledges that, while the parties’ original family will take on a different form after the divorce, their original family will still exist and need to be nourished. 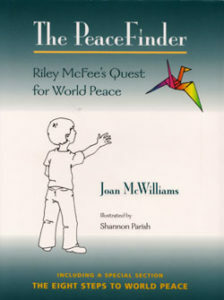 A delightful but significant story about one boy’s global search for peace with profound messages embedded in the words. 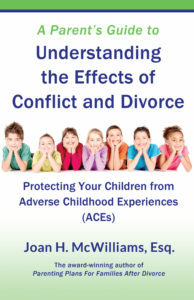 A Parent’s Guide to Understanding the Effects of Conflict and Divorce is a must read for parents contemplating divorce, are in the middle of a divorce or are navigating post-divorce issues. Joan McWilliams shows parents how Adverse Childhood Experiences (ACEs) harms children and how they can give them the gift of Resilience.